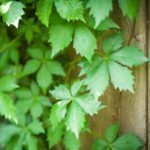 I planted a Virginia creeper late spring and it was initially growing 1 inch per day for the first month or so. For the last 1 to 1.5 months, it has stopped growing. I'm concerned that because it is in a fairly small planter box on my deck to grow up my privacy fence, that there simply isn't enough soil/nutrients to support the root system. 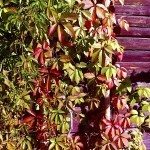 Should I be re-planting the creeper into the ground below so that there is ample soil? The other concern is that I want to make sure the roots have time to recover before the snow comes. Ideas?